I love, love, love lasagna, but it is quite a labor of love, and sometimes you just don’t want to labor for love. Lasagna can also be rather heavy and meaty, which is kind of awesome in cold, dreary January, but less so when Spring is trying to get sprung and lenten guilt is looming large for many. Enter my vegetarian California Lasagna. At first I didn’t know what this dish had to do with California other than that’s what the blend of frozen veggies is usually called. But the further I got along in recipe development, the more sense it made, as it exemplifies the best elements of California cuisine. 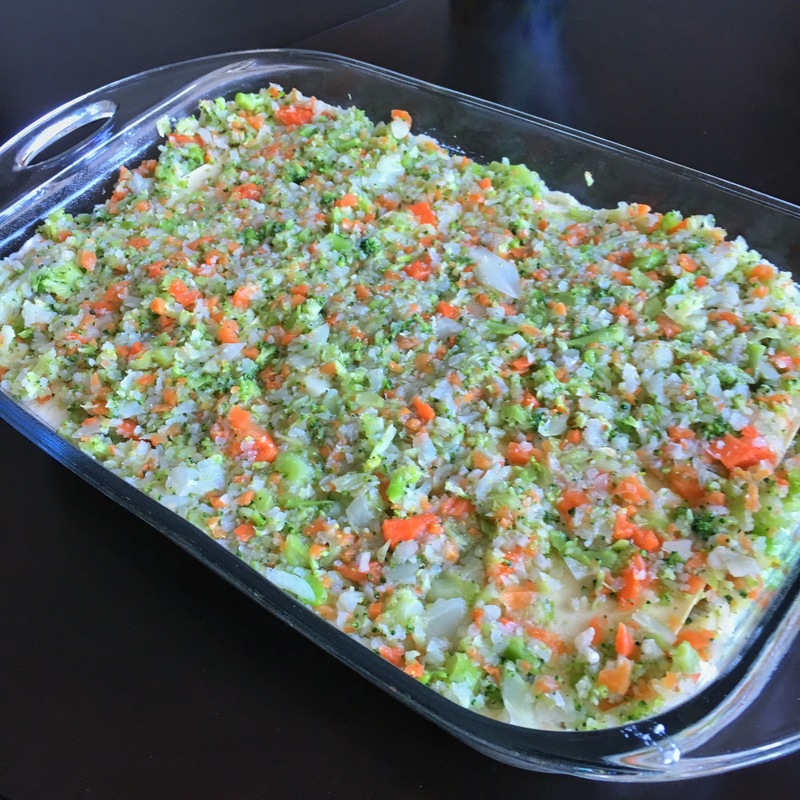 It’s loaded with healthy veggies, the ricotta packs a protein punch without the use of meat, and compared to a lot of other lasagna recipes, it’s fairly low carb (bet there are even gluten-free lasagna noodles. Zoodles, anyone?) Like the images on those sun-drenched TV ads, this recipe is easy and chill. No multiple pans and hot stovetops for sauces and noodles, just a food processor and a couple of bowls. No complicated grocery lists, you might already have the ingredients around your kitchen…and if you don’t, play around with what you do have and enjoy every moment and bite of it. Preheat your oven to 375 degrees and make sure a rack is positioned in the middle. In a food processor, pulse the garlic until it is finely chopped. Add the veggies and pulse until they are minced, but do not puree. Break up any large chunks separately, if need be. No food processor? No worries, simply mince or grate the garlic and chop the veggies into small pieces with a knife. Transfer the chopped garlic and veggies to a bowl and combine with the water, lemon zest, 1 teaspoon kosher salt and 1/2 teaspoon black pepper. Set aside. In another bowl, combine the ricotta, garlic powder, onion powder, eggs, and the remaining salt and pepper. Once thoroughly mixed, gently fold in the chopped basil. Coat a 13 x 9-inch glass or ceramic pan with cooking spray. (I have not tested this recipe with a metal pan, but it is probably fine if that is what you have handy). Spread 1 cup of the veggie mix evenly on the bottom of the pan. Evenly place 3 no-cook lasagna noodles across it. Next, spread half the ricotta mixture over the noodles followed by 2 cups of the veggies. Repeat with 3 noodles, the remaining ricotta and 2 cups of veggies. You might need to give the veggies a quick stir before each layer so that the water stays incorporated. Finally, layer the last 3 noodles and remaining veggies. Top with the 2 cups of shredded cheese and tightly cover the pan with foil. I like to spray the underside of the foil with cooking spray to help prevent the cheese from sticking if there is not enough clearance. Bake covered for 25 minutes, then another 5-10 minutes uncovered until the cheese is bubbly and golden. If you want to make the lasagna ahead of time, follow steps 2-7 and refrigerate until ready to use. At mealtime, preheat the oven, then bake the lasagna covered for 45 minutes, followed by another 10-15 minutes uncovered. Once baked, allow the lasagna to rest and set a good 10 minutes before serving and noshing!